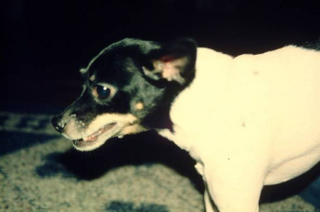 Coughing is a common symptom of severe heart disease (see Congestive Heart Failure) in dogs, but is less commonly seen in cats with heart disease. However, coughing can also be a sign of problems in the respiratory system such as lung disease, asthma or other problems in their airways. Cough may be noted during and after exercise, when your pet lies down, at night, after drinking water or may seem to occur consistently throughout the day. In the animal with a cough or any other breathing problem, the veterinarian will use a number of tools to determine if the cause is heart disease, lung disease (such as collapsing trachea) or both (which is often the case in older dogs). In cats, coughing can be confused with dry heaving or hairballs. Your veterinarian will typically start by doing a full examination of your animal, including listening to the heart and lungs with a stethoscope. One test that veterinarian may do in both dogs and cats is to cause the animal to cough by gently squeezing on their trachea (windpipe). Normal animals usually will cough once or twice and then stop. An animal with a coughing problem usually will cough for several seconds after the trachea is squeezed. Depending on the results of this initial examination, your veterinarian may recommend other diagnostic tests, such as chest x-rays, an electrocardiogram, an echocardiogram, or other diagnostic tests to determine if heart disease is present and, if so, how severe it is. Does it occur at certain times of day: when the animal gets excited, after eating or at night? Does your pet ever cough up anything? If so, what is the appearance of this material?